I am proud to admit that I have not purchased a bag or box of pre-made croutons in at least 13+ years. I was literally at the grocery store just a few hours ago and saw a couple picking up a bag; I had to chuckle to myself because I was actually contemplating telling them how easy it was to make their own and that they are handsdown better than what you can buy at the store any day of the week. I can see the headlines now; women arrested in Market Basket produce for accosting couple over bagged croutons. I refrained… I then saw the same couple pick up a premade bag of salad; I tried not to judge. 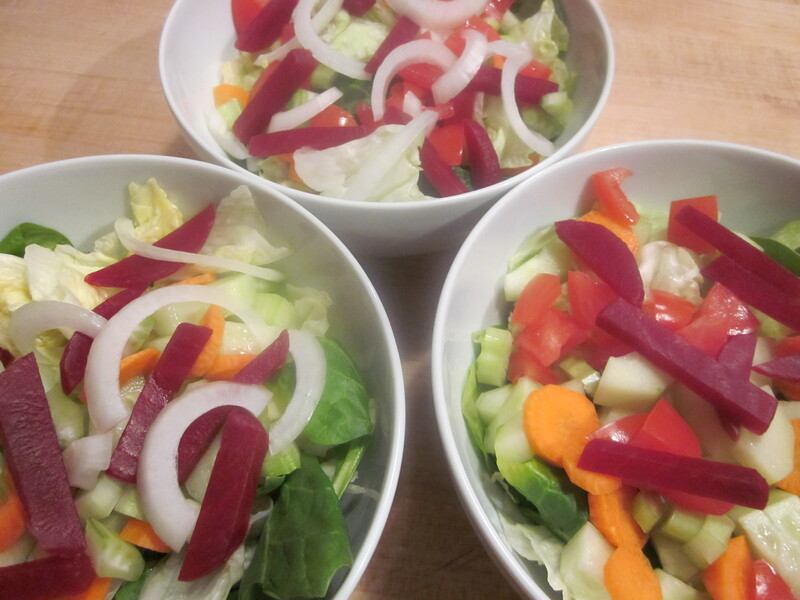 I am not perfect by any stretch; I have made my own coleslaw many times over the years but I will confess that it is way easier to buy a tri-color bag of shredded cabbage and carrots; I do make my own dressing for the slaw but sometimes everyone needs a little assistance. 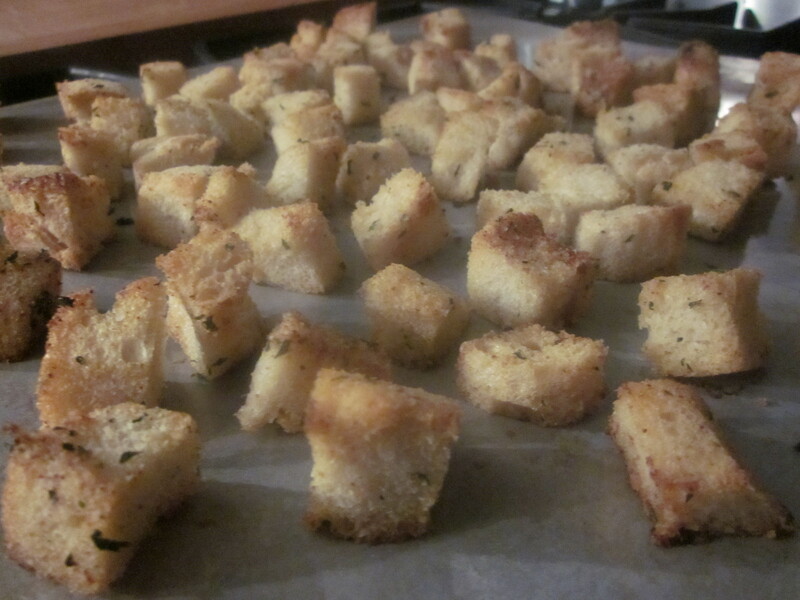 Crust removed from whatever bread you want to make the croutons from. 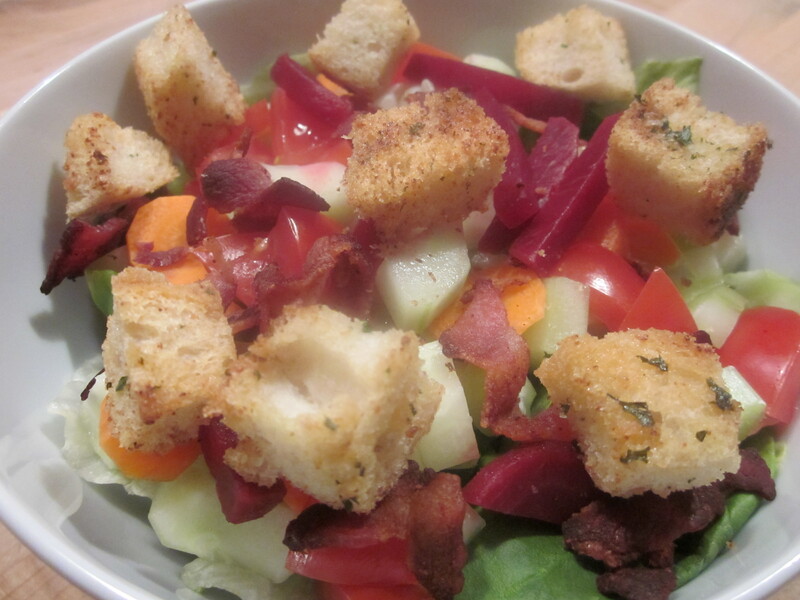 I tend to make croutons every time we have leftover French or Italian bread that we had for dinner the night before, I have also used whatever sandwich bread we have in the drawer. Remove crust; cube into the size you want to eat; place in a ziploc bag; add olive oil; just enough to lightly coat the bread. Combine all the above ingredients; add to the coleslaw and let set for 10-15 minutes until it melds. Great on pulled pork sandwich!